Every wonder if you could be missing something or ignoring the wrong things in your life? Your dreams could be filling in the gaps and you have no idea. 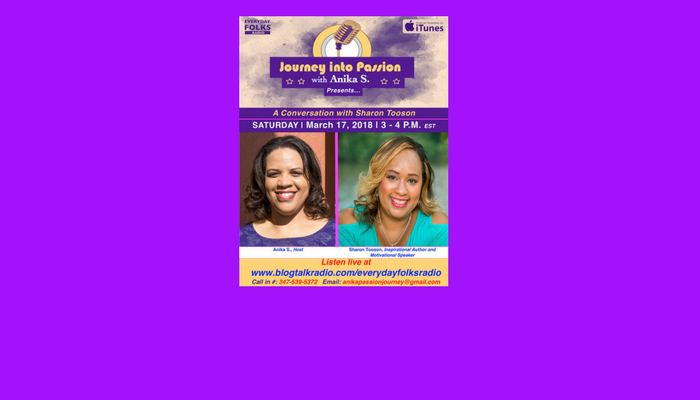 Today at 3pm EST, Sharon Toonson, Inspirational Author and Motivational Speaker of https://www.toosontownpublishing.com/ will share the gift God gave her of analyzing dreams with us on Journey Into Passion with Anika S. on Everyday Folks Radio! Tune in by going to www.blogtalkradio.com/everydayfolksradio or call 347-539-5372. Have a question or commen? You can call in and press 1 when you are ready to ask your question. Or you can send an email to anikapassionjourney@gmail.com.